The BRS Add-On Faucet Kit includes everything needed to bypass the DI (deionization) stage and add a pressurized tank and faucet to your reverse osmosis system. The pressurized tank insures that 3.2 gallons of water will be available on tap for immediate drinking water. RO/DI unit sold separately. This Add-On Faucet Kit is necessary to set up your reverse osmosis unit to supply drinking water on demand. Tee for bypassing the DI stage. Product low quality. Kit in name only...you will have to order additional parts. This thing is superior to every way to counter-top pitchers. Installation is easy. You have much better water. You change filters less frequently. It's much cheaper in the long run.You have much more water at your disposal. It produces much faster. It saves counter space. It's more attractive. I don't know why anybody (any reefer with an existing RO system, anyway) would not have this. I'm annoyed I didn't buy it years ago. 3 weeks after the instal the taste was starting getting earthy/musty . Luckily the wife did not notice it but I had to fix it fast. I tasted water feeding into the tank and it was fine so that means the tank was growing something. i fixed the contamination with 25 ml of Io-Star . This is an iodine based product used for sanitizing home brewing equipment. I filled the tank almost to max capacity and added the Io-Star , let sit for 1 hour. Empty the tank and fill again. done. problem fixed (fingers crossed). I can't say the tank was contaminated then I got it. it looked clean and had a little cap covering the inlet to prevent anything getting in. I think I probably did some contamination when I was changing the block filters in the RO system or maybe starting a syphon with my mouth and then sticking the tube in the tank. Love having this add on easy to hook up to my brs 150 gallon system. no more trips to the store to buy drinking water! I one of those crazy anti-fluoride people! This tank was easy to hook up to my RO unit and refrigerator for drinking water. I have to refill about twice a week for two people's drinking water and ice cubes. I recently installed this add-on for my RO/DI System (also from BRS) and I'll admit, I was tempted to cheap out or buy the components locally rather than waiting for delivery from BRS, but I am SO glad that I didn't! I love the quality of the parts sent with BRS products, the installation was a snap! My one hesitation when it came to buying this kit had been a fear that low water pressure from the tank was simply inherent with this type of system, and I'll admit, I'm a bit impatient. Well, let me tell you, the pressure I receive is AMAZING! It's nearly as fast filling containers with RO water as it is with my tap water. If you are considering this add-on, I highly recommend it! This system is great. No taste issues reported by other users and was easy to install. I would suggest two things. First, include a small amount of Teflon Tape. The metal to plastic unions on both the storage tank and the faucet are likely to slowly drip without it and I'm told it's standard practice to use whenever joining plastic to metal, especially male metal to female plastic. 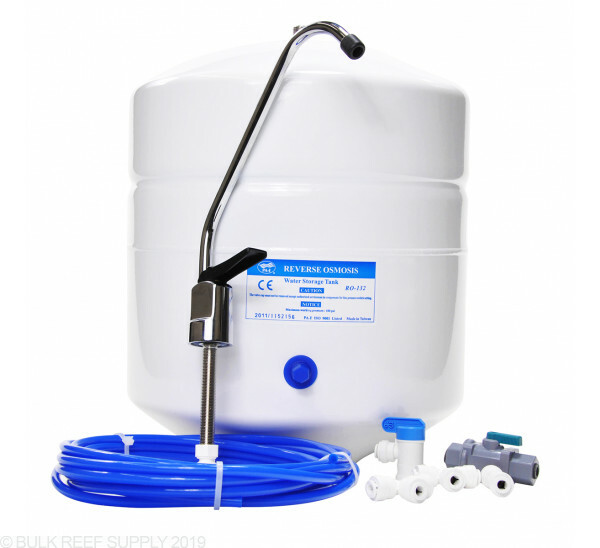 Second, Any reefers adding this on to their reef RO/DI instead of having a separate system should probably get a three way valve to facilitate switching between. I had to get this. It is how I got the wife to agree to a water filter for my tank. It was very easy to install. The water taste so much better than the regular tap. Now the wife wants me to run the water over the frig. My job is never done. This kit seems great on paper, but when the water in the tank sits within, the water becomes contaminated. The water from the tank emits a foul odor, and has an unclean taste. When the system is bypassed, the water tastes and smells as it should. BRS suggested that I buy another filter to run post-storage tank. This seems ridiculous to send water through the RODI to clean the water, have it sit in a storage tank, and then have to clean it again. And if this is a viable solution, why don't you offer this as part of your add-on faucet kit. Upon doing a little research online, this seems to be a common problem with the PA-E reverse osmosis tank. When I informed BRS of this problem and requested a refund, they said that I couldn't return a used item. I'm thoroughly displeased with the whole affair. We are in well water that doesnt taste very good so we added this system to pure rodi unit and plumbed in into the refrigerator and were amazed on the difference it made. We run filters sediment and carbon coming into the house and one on the refrigerator and this is night and day different. I wish we had done this a year ago now. Installation was quick and easy. Parts were all high quality and worked well together. How do you know when the tank is full, or how is an auto shutoff valve used with this? I have the 4 stage RO/DI value plus system that I have already bypassed the DI and fill water cooler bottles with. The water comes out pretty flat tasting, so I add 1/4 tsp of salt per 5 gallons for flavor. Is it possible to do this with this system? We are unfortunately not aware of a way to add elements back in on our current units. This may be done with a re-mineralization filter or something along those lines however is not an item we would have available. What is the physical size of the tank? The tank has a diameter of 10" and with adapter is 15" high. Feel free to let us know if you have any further questions! Why bypass the DI feature when filling the drinking tank? Is DI water only needed for aquarium use and not for drinking water? Its generally not recommended to drink DI water as it may be "too pure". Drinking RO only water is recommended, hence the bypass. I purchased your RODI value plus system recently. If I want to down the road can I upgrade my unit to this? The Add on Faucet kit and easily be added onto existing RO units by connecting to the product water line coming out of the unit. Feel free to let us know if you have any further questions! I have this on my 6 stage 75 god system and wanted to know, Can I add on the additional RO membrane to make a 150 gpd system if I am already making drinking water? You certainly can add on the 150 gpd upgrade kit however if used in conjunction with an RO pressurized tank the waste ratio will eventually equalize back to around 4:1 so this negates the positive impact of reducing waste water. This still will increase production however. Feel free to let us know if you have any further questions! 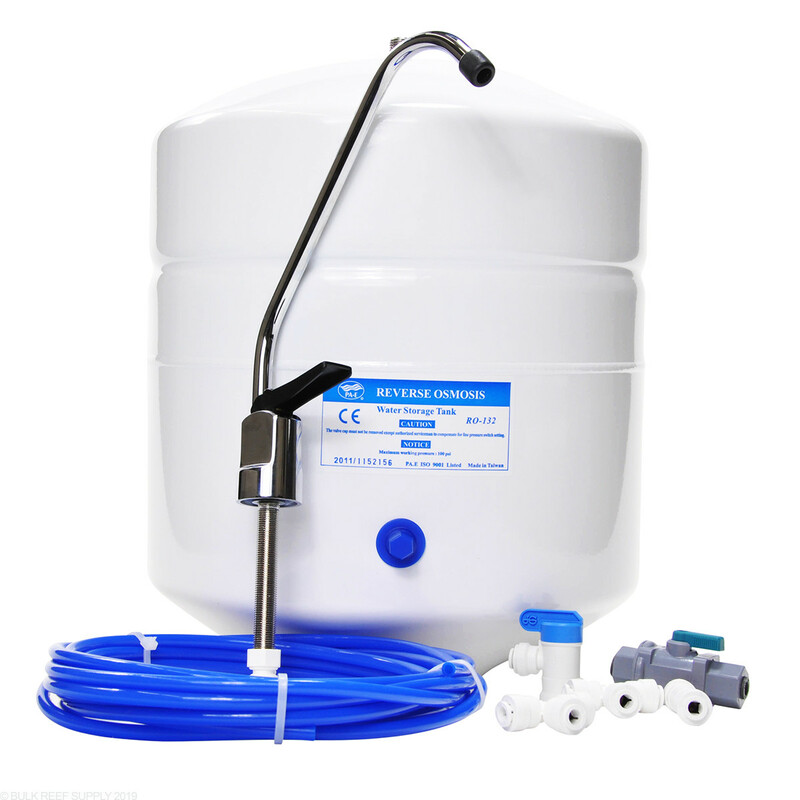 I have a question about how you install this: I have the 6 stage unit, so I cut the tube from the first 4 to the resin 2 and T that off into this drinking water tank via the included check value? I have included a link below to video instructions. The RO water will be Tee'd off just as you described then run to the check vale, after the check valve the water will Tee again with one side connecting to the pressurized tank via the tank adapter and the other side to the faucet. Feel free to let us know if you have any further questions! Can the silver faucet be replaced with the brush on nickel faucet? My sink is brush on nickel and it might look a little odd with the silver look. Thats not a problem, just mention in your order comments (stage 2 of checkout) that you want the nickel and wed be happy to swap it out for you.